Let's get the Ebiten source code and compile it. Ebiten requires X Window system and you need to install a window manager like GNOME3. See the official manual. Note that you also need to do pkg install xorg. Install Go on your machine. Ebiten requires Go 1.11 or later. Git is required to get most of Go packages including Ebiten. You also can get Git via Scoop. The official Git installer is also fine. A C compiler is required as Ebiten uses not only Go but also C.
On the latest macOS, just type clang on your terminal and a dialog would appear if you don't have clang compiler. Follow the instruction to install it. In this case, run xcode-select --install and select commandline tools. OpenAL is required for Ebiten's audio package. Note that the openal package is pretty old and doesn't work. Install openal-soft instead. Ebiten can be downloaded as a usual Go library. Ebiten is available both with and without Go modules. Go modules are available as of Go 1.11. # Create a directory for your game. # Initialize go.mod by `go mod`. # Use URL for your package like `github.com/yourname/yourgame`. # If you are not sure and don't plan to share it so far, `example.com/m` is fine. Ebiten package is automatically downloaded when executing your program that imports github.com/hajimehoshi/ebiten. example.com/m is an arbitrary URL for local testing. Use your project's URL (e.g. github.com/yourname/yourproject) when you make this public. 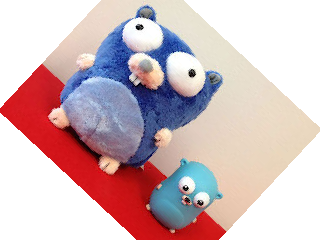 For more details about Go modules, see the Wiki article. ... means to install not only Ebiten but also its sub-packages (and their dependencies). Let's execute an example to check installation finished correctly. If you see the window with a rotating Gophers picture, congratulations! You have succeeded to install Ebiten. Note that -tags=example is needed to execute the examples as the Ebiten example packages require the build tag.